The land that gave birth to the first great civilization needs little introduction. The pyramids, the minarets, the Nile – the scope of Egypt is magnificent.Visitors are surprised to discover that those legendary pyramids are merely the tip of the archaeological iceberg. Pharaonic nations, ancient Greeks, Romans, Christians and Arab dynasties have all played their part in fashioning Egypt’s embarrassment of architectural wealth. Cairo’s chaos whirrs around a medieval core that has remained unchanged since the founding days of Islam. Upriver, Luxor, the site of ancient Thebes, is lined with warrens of opulent burial chambers and boasts some of the most formidable monuments in all antiquity. Further south at Aswan, even more geometrically imposing temples write a testament to the power of archaic gods and omnipotent pharaohs. It is here that the Nile is best explored by ancient sail, on a felucca (Egyptian sailing boat) at the hands of the prevailing currents and winds. Out west, Egypt’s ocean of sand stretches infinitely to the Sahara, with a handful of oases feeding solitary islands of green. Hivelike, medieval fortresses cower out here, interspersed with bubbling springs and ghostly rock formations. Meanwhile, the deep, crystal waters of the Red Sea lie brilliantly awash in coral, surrounded by an aquatic frenzy of underwater life. In the deserts of Sinai’s interior, visitors can climb the mount where God had word with Moses, and spend their remaining days in halcyon bliss at coastal Dahab’s backpacker Shangri-La. Though it is one of the more politically stable countries in the region, modern-day Egypt is not without strife. Thirty years of authoritarian rule, an erratic economy and rising living costs fan the flames of social unrest. Still, Egyptians are a resilient lot, and visitors making the journey here will find as much ancient history as they will modern hospitality. Of the many things to do in Egypt, one of the most entertaining events is shopping. Visitors can haggle at the local bazaars, such as the famous Khan el Khalili in Cairo, and find a great deal of variety in products and merchandise at the innumerable shops that line the streets. From alabaster to Egyptian fashion, travelers will enjoy the colorful array of goods. 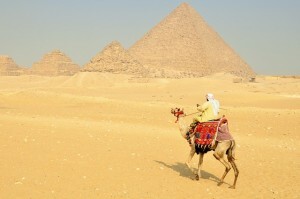 One of the best activities in Egypt as well as the best way to see and experience the country is on a Nile River cruise. Visitors can book passage on one of the many vessels offering accommodations for anywhere between three to seven nights. Travelers can experience the life of a pharaoh and his lady cruising on the grand Nile River in a felucca, a traditional sailboat, or on larger, more modern craft. Another of the top ten things to do in Egypt is to visit the Pyramids of Giza, along with the Great Sphinx, and other pyramids around the country, including those at Dahshur and Saqqara. Each night in Giza, a grand light show takes place three times and is a breathtaking spectacle that hundreds of visitors enjoy each year. Visiting the temples is probably one of the activities in Egypt that everyone does at some point during their trip. Two of the most famous temples are Abu Simbel and Karnak. Many people gather at dawn at Abu Simbel to see the rays of light slowly illuminate the façade of the temple in glowing shades of red. Karnak is a great complex built and expanded over more than a thousand years; today, visitors can walk the same halls as the pharaohs once did in ancient times. Visiting the beaches is always a wonderful spectacle, but taking in a bit of culture can be among the most charming and delightful Egypt activities. One of the best museums in the country is the Pharaonic Village that sits on the shores of the Nile. Here, a live enactment takes place each day, portraying the life and times of Egyptians who lived in the time of the pharaohs. Other interesting things to do in Egypt include visiting the Egyptian Museum in Cairo and the Luxor Museum. Typically, Egypt is not associated with gorgeous beaches and water activities as much as with the great pyramids and sphinx, but the beaches of the Red Sea and the Mediterranean Sea are among the most beautiful in the world, offering not only plenty of opportunities for sunbathing but excellent waters and wildlife for snorkeling and scuba diving as well. 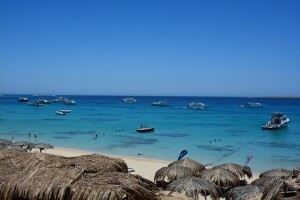 Many visitors travel to Egypt specifically for the inexpensive yet luxurious beaches and accommodations found in cities such as Marsa Alam, Dahab, and Hurghada. One of the most exciting things to do in Egypt is to go diving and snorkeling in the coastal waters. The best places for these Egypt activities are in the Red Sea and in the Gulf of Aqaba; Sharm el-Sheikh is a popular destination for visitors who are attracted to the sea. Be aware that this may require a visa if you’re diving in the marine parks, such as Ras Mohammed. Egypt’s climate is easy to summarise: hot and dry, with the exception of the winter months of December, January and February, which can be quite cold in the north. 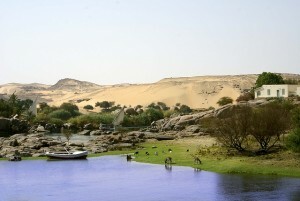 Average temperatures range from 20°C (68°F) on the Mediterranean coast to 26°C (80°F) in Aswan. Maximum temperatures for the same places can get up to 31°C (88°F) and 50°C (122°F), respectively. At night in winter the temperature sometimes plummets to as low as 8°C in Cairo and along the Mediterranean coast. In the desert it’s even more extreme – often scorching during the day and bitterly cold at night. Alexandria receives the most rain, approximately 19cm a year, while far to the south in Aswan the average is about 10mm over five years. Al-Kharga in the Western Desert once went 17 years without any rain at all. Between March and April the khamsin (a dry, hot wind) blows in from the parched Western Desert at up to 150km/h. The sky becomes dark orange and choked with dust and, even when everyone closes all doors and windows tightly, the inside of every house is covered with a patina of grit so that they resemble undisturbed tombs. The best time to visit Egypt depends on where you want to go. Generally speaking, winter (December to February) is the tourist high season and summer (June to August) is the low season in all parts of the country except on the coasts, and to a lesser degree in Cairo. Hotel prices reflect this. Weather-wise, June to August is unbearable almost anywhere south of Cairo, especially around Luxor and Aswan, where daytime temperatures soar up to 40°C. Summer in Cairo is almost as hot, and the combination of heat, dust, pollution, noise and crush makes walking the city streets a real test of endurance. On the other hand, a scorching sun might be exactly what’s wanted for a week or two of slow roasting on the beaches of southern Sinai, the Alexandrian coast or the Red Sea – just be prepared to fight for hotel rooms with locals on their summer holidays and Gulf Arabs escaping the even greater heat in their home countries. When visiting somewhere such as Luxor, winter is easily the most comfortable time. Cairo isn’t quite as pleasant, with often overcast skies and chilly evenings, while up on the Mediterranean coast Alexandria is subject to frequent downpours resulting in flooded, muddy streets. Even Sinai’s beaches are a little too chilly for sunbathing in January. The happiest compromise for an all-Egypt trip is to visit in spring (March to May) or autumn (September to November). Most of Egypt’s religious and state holidays last only one or two days at most and should not seriously disrupt any travel plans. Buses, however, may be fully booked around the two eids (Islamic feasts) and on Sham an-Nessim. Ramadan, the Muslim month of fasting, can be ­seriously disruptive to your best-laid travel plans. During daylight hours many cafés and restaurants are closed, while bars cease business completely for the duration. Offices also operate at reduced and very erratic hours. By international standards Egypt is still fairly cheap, though admission fees, guided tours and private transportation can really hike up the price. If you’re a hard-core budget traveller, it’s possible to get by on about US$20 a day or maybe less, though you will have to stick to the cheapest hotels, eat the staple snacks of fuul (fava beans) and ta’amiyya (felafel), use the cheapest local transport and limit your sightseeing. At the other end of the scale, Egypt has plenty of accommodation charging upwards of US$200 a night, and some of the better restaurants will set you back US$20 per person or more. Taking a middle route, if you stay in a modest hotel with a fan and private bathroom, eat in low-key restaurants frequented by locals (allowing for the occasional splurge), and aim to see a couple of sites each day, you’ll be looking at between US$30 and US$50 a day. Getting around the country is cheap: the 10-hour train ride between Cairo and Luxor can cost as little as US$6 in 2nd class, and even domestic flights on EgyptAir can cost as little as US$35. However, private taxis in convoys between tourist destinations can get pricey, though these are often the safest and most comfortable way to travel. The major expense is going to be the entry fees to tourist sites. Foreigners are seen as dollars on legs, so places where they flock tend to be pricey. A complete visit to the Giza Pyramids costs more than US$50 in admission charges, while seeing the mummies at the Egyptian Museum costs about US$25. However, if you have a valid International Student Identity Card (ISIC), you can rack up some serious discounts. Of course, no card will make you exempt from the seemingly obligatory demands for baksheesh, which can seriously drain your wallet if you’re not careful. A service charge of between 10% and 15% is applied in most upmarket restaurants and hotels, to which value-added tax (VAT) and municipal taxes are also added. In other words, the price that you are quoted at a hotel or read on a menu could be almost 25% higher when it comes to paying the bill. The official currency is the Egyptian pound (E£) – in Arabic, a guinay. One pound consists of 100 piastres (pt). There are notes in denominations of 5pt, 10pt and 25pt, but these are rarely spotted. The 50pt, E£1, E£5, E£10, E£20, E£50 and E£100 notes are widely used. There’s also a rarely seen E£200 note. Coins in circulation are for denominations of 10pt, 20pt and 25pt, 50pt and E£1, but they seem to be almost nonexistent and are sometimes thought of as collector’s items. Prices can be written in pounds or piastres; for example, E£3.35 can also be written as 335pt. In practice, however, vendors tend to round up, ­especially if you’re a tourist. There is a severe shortage of small change in Egypt, a reality that quickly becomes a nuisance for travellers frequenting ATMs. The 50pt, E£1, E£5 and E£10 notes, which are useful for tips, taxi fares and avoiding the painfully repetitious incidents of not being given the correct change, are not always easy to come by. Even worse is that staff in businesses including upscale hotels and restaurants will sometimes scowl at you if you pay your bill in E£100 notes, thus forcing them to take to the streets to round up change. As a good rule of thumb in Egypt, make sure you hoard small change wherever possible. Also, be sure to cash out large bills in upscale establishments, even if they initially appear unwilling. These two simple practices will save you an indescribable amount of frustration. The black market for hard currency is negligible; few travellers can be bothered hunting it out for the fraction of difference it makes. Because of the dire state of the national currency, many tour operators and hotels will only accept payment in American dollars or euros. This applies when it comes to purchasing tickets for the Abela Sleeping Car train running between Alexandria, Cairo, Luxor and Aswan; the Nuweiba to Aqaba (Jordan) ferry; and all international buses. Although technically illegal but never enforced, it is also becoming increasingly common for upscale hotels to demand payment in US dollars, though more times than not you can charge your room on a credit card. To be on the safe side, it’s a good idea to travel around Egypt with a modest supply of dollars.